Log in to access member-only benefits, register for an event or log your CPD. In addition to your professional status as a member of the IMI, you have access to a number of products and support services specifically developed to meet your professional needs. More information and details of how to access these are given below. A comprehensive range of products and support services are available to you as an IMI Member. You or your business may be eligible for further recognition from the IMI. If you’ve gained a higher level of qualification and/or additional experience since you joined the IMI, you may be eligible for an upgrade. Record your CPD, track your progress and receive credits. 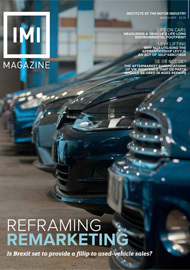 The latest IMI Magazine features and access to archived information. If any of your details change, e.g. contact details, address, employer details, please let us know. You can renew online here in a few simple steps.